Here you have it, ladies and gentlemen. 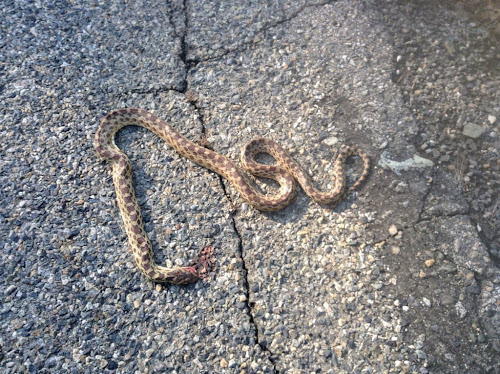 A side-of-the-road snake fatality. I have yet to see any live snakes thus far on this trip (thank the god almighty), but I have seen a number of dead snakes on the side of the road. All previous dead snake sightings have been at the most inopportune time for a photo, either on the roadside of a steep ascent or a steep descent. But this snake sighting was on fairly level ground, so it was worthy of stopping for a photo. Although there is a good amount of blood pooled around this snake's head (suggesting the thing is actually dead), I had fears of the thing coming back to life. 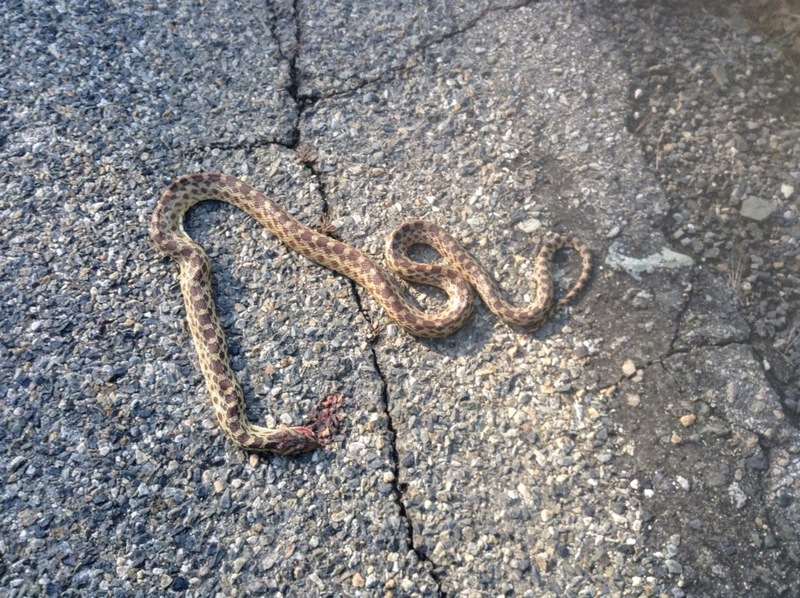 Alex and I had both stopped to photograph this slithering, lifeless beast. Alex photographed the snake first. Then, as I was pulling out my camera to take a photo, Alex started biking away. You can bet your booty that Alex got a mouthful for leaving me alone with that thing! Today's elevation profile was what I call a "razortooth profile." In other words, the profile suggested a number of rollers with really steep climbs and really steep drop-offs. 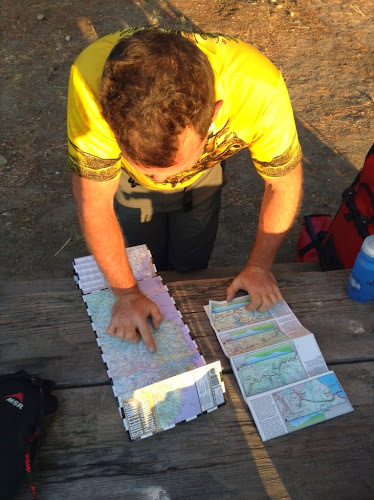 Not having access to cell reception or wifi at the campground this morning, we did our best to consult all our maps to see if there was an alternate route. No luck. We rode on very quiet and beautiful roads today. So, off we went! As has been the case the last few mornings, Alex and I have been pulling out of camp around 7am, just as Randy is preparing his morning coffee. Randy is a strong rider, and so he catches up with us later in the day. Despite the razortooth elevation profile, the ride today was actually quite lovely. It indeed involved a lot of switching between the small and middle chainrings. However, I enjoyed alternating between spending a few minutes climbing a steep section and then having a few minutes of relaxing downhill. We were looking forward to passing through the town of Auberry, as it would be the first legitimate town that we rode through since Three Rivers, the town just outside of Sequoia National Park. Our map indicated that the population of Auberry was 2,369 people, which generally suggests we can find some sort of wifi connection. 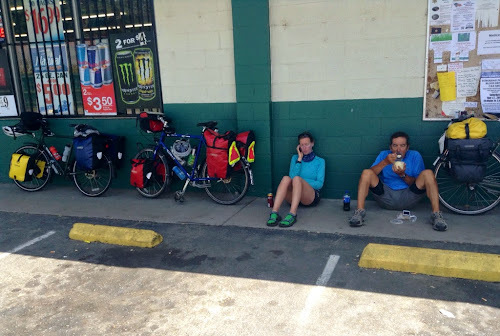 As it turns out, the only place we could find a wifi connection was the grocery store, Ponderosa Market. And the only way we knew the market had wifi was because we asked the checkout lady for a place with wifi and she said "I'm sure the market owner will let you use ours. Just bring in your devices, and the owner will type in the wifi password for you." 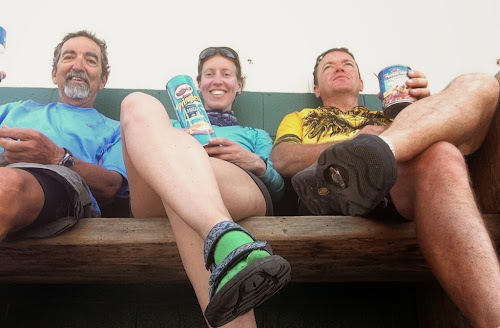 And so we spent the next few hours sitting outside the Ponderosa Market, updating blogs, checking in with folks at home, and enjoying lots of salty food and cold drinks. Alex updates his blog outside the Ponderosa Market. After a little while, Randy caught up with us. We were a little worried Randy wouldn't be able to find us as he passed through town, but the town of Auberry was so tiny that it would have been difficult not to be able to find us. As I called home to check in with my mom, Randy enjoyed a sandwich and some potato salad. Me and Randy at the market. The owner of the market, Bir, was amazing. She kept expressing gratitude that we had stopped by her store. Gratitude? Seriously! Wowsers! We made sure to go into the store every 15 minutes or so in support of Bir's awesome market. Bir offered that we could use her restroom, and she suggested that we make ourselves comfortable on the bench outside in the shade. Ok, we could do that. Making ourselves comfortable on the bench. Bir also said we could fill up our bottles using the faucet at the back of the store. When Alex inquired about the faucet, which apparently didn't have a handle, Bir pulled a gallon of bottled water off the shelf and said "Here, have this." Wowsers! Bir not only went above, but she also went beyond to make our visit to the not-much-of-anything town of Auberry quite amazing. Thank you, Bir! 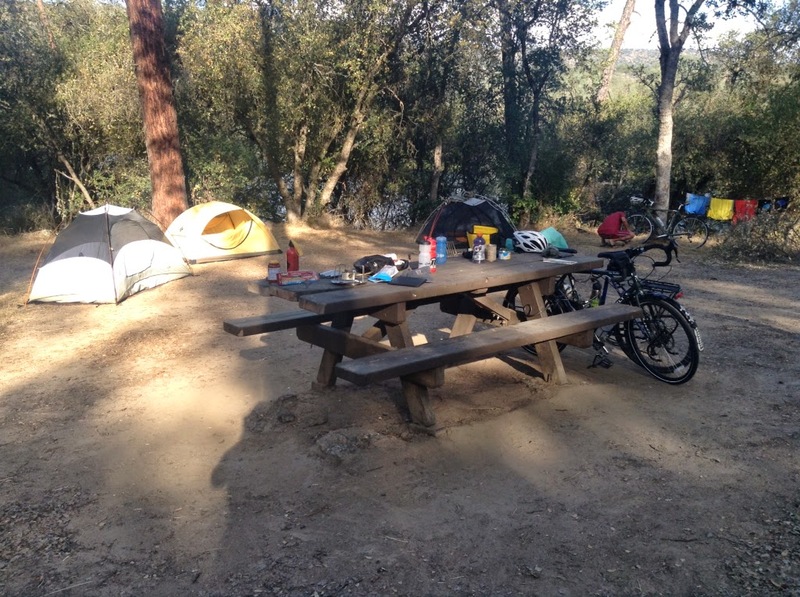 After leaving Auberry, we biked the final nine or so miles to our campground. Boots atop fence posts. 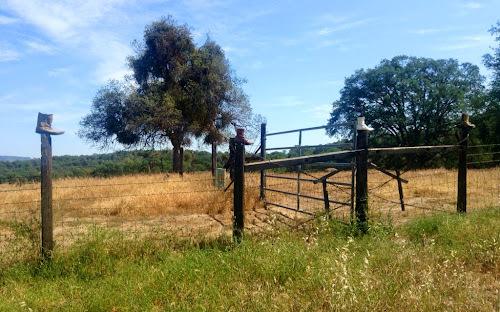 This has been a common site along our route. The side of the road has these small reflective signs. From what we can tell, the signs appear to be recycled -- pieces of larger signs cut into smaller ones. 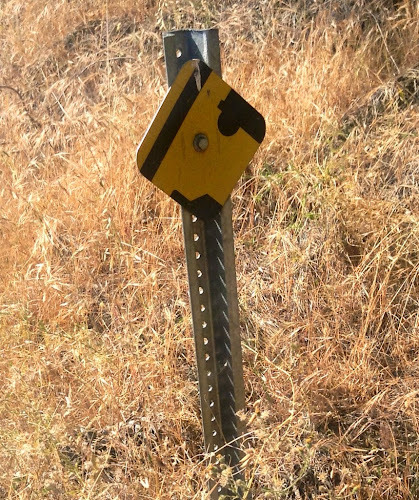 We only noticed this when we entered into Fresno County, and so we're curious if we continue to see the signs once we pass out of Fresno County. Kudos to the resourcefulness of whoever thought up this idea! 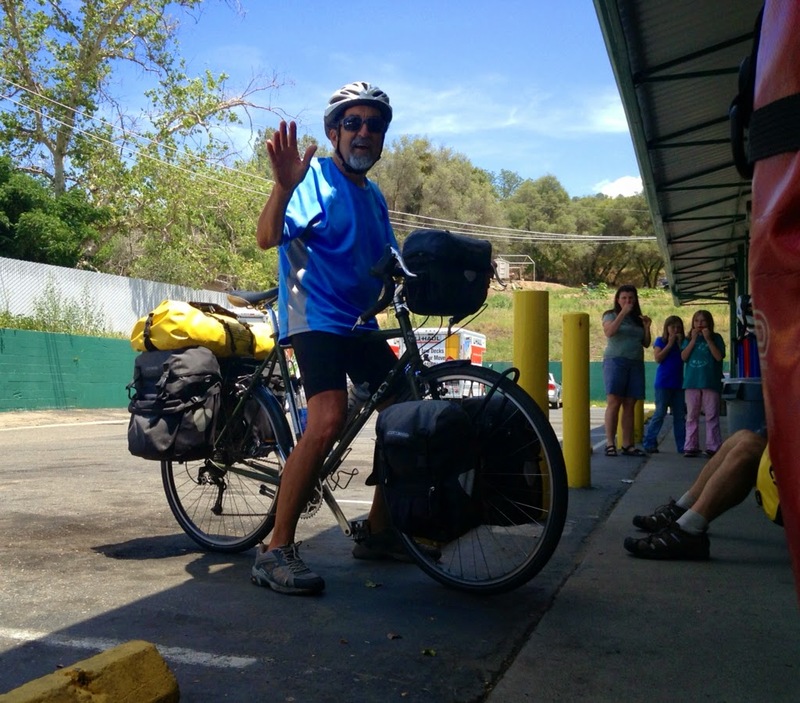 Randy had left the Ponderosa Market about 45 minutes before Alex and I left the market. When Randy arrived at the campsite, he jokingly asked the campground host when the beer truck would be making its rounds. A little bit later, the host stopped by the campsite. The host felt bad that he didn't have a beer for Randy, so he offered him a joint instead. Randy was grateful, but he declined. I'm telling ya'all, we continue to be blown away by the generosity of folks on this trip. Really! Our campsite is right on the chilly San Joaquin River. 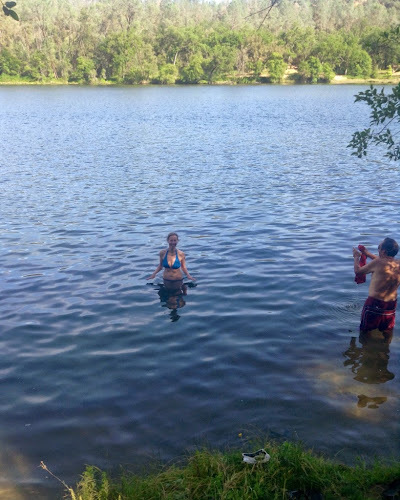 As the campground doesn't have shower facilities, we figured we'd bathe in the water instead. 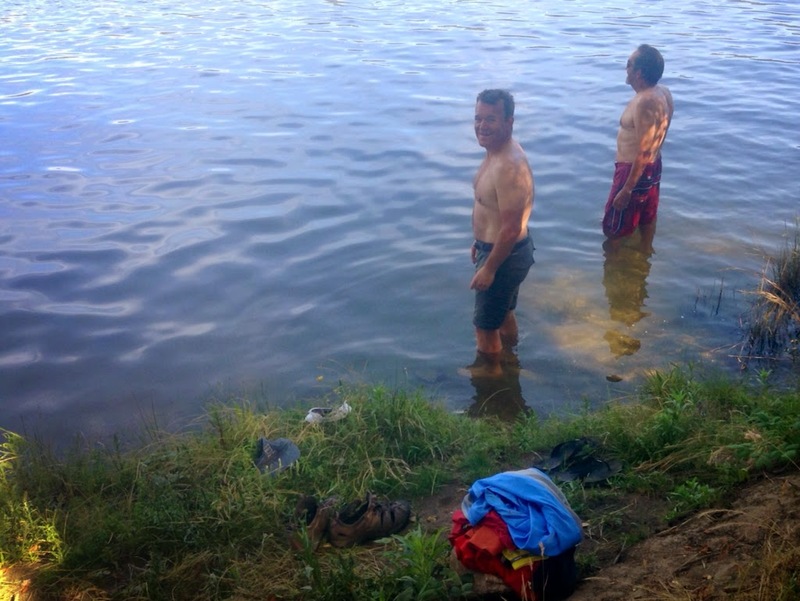 Randy was the bravest of us all -- he did a full dunk in the river. I managed to dunk myself neck-deep. Alex did his best to pretend that he was getting wet above the waist. Alex and Randy in the river. Me in the river, as Randy does his laundry. It's funny to think that the whole time we've known Randy, neither Randy nor I have had a proper shower. (Alex snuck in a shower in Sequoia -- Alex is such a pretty boy). Ever since our rest day a few days back in Lake Isabella, Alex has been an entirely different person; Mr. Crankypants has disappeared! Alex is now getting into the swing of touring. It's fun to see him get all excited when he tells the townspeople about our trip. And it's fun to hear him scream "woohoo" on the downhills. And it's fun to hear him say, "Today was a really great day." 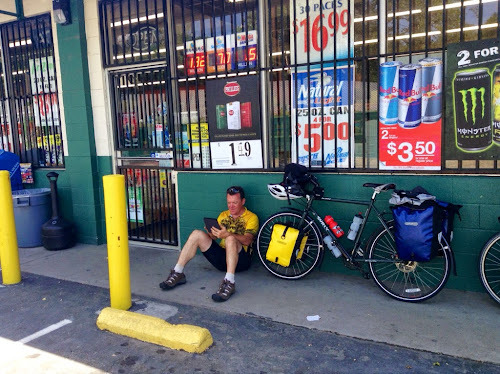 When we first met Randy a few days ago, he was thinking about biking as far as Lake Tahoe and then abandoning the route. But today over dinner, Randy mentioned that he'd like to bike with us beyond Lake Tahoe. Sweet! We're really enjoying Randy's company! 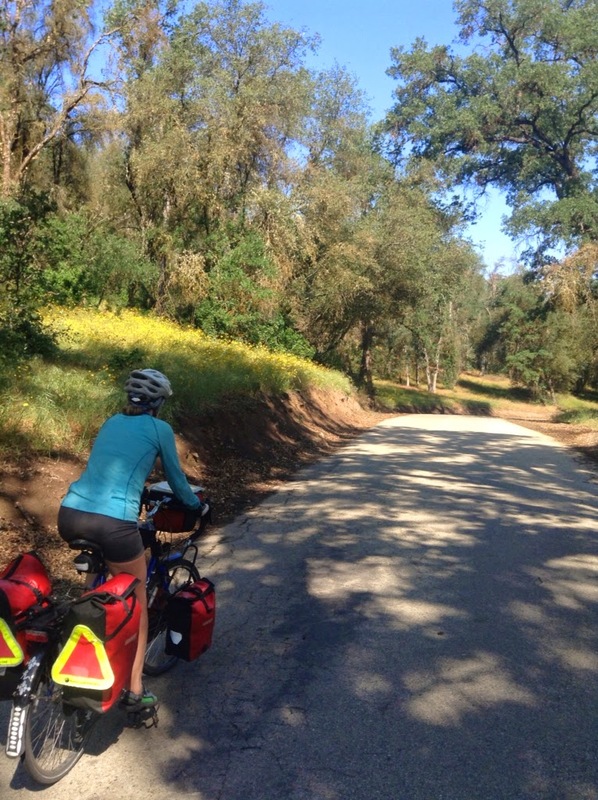 Bike touring is awesome! Even on those small and middle chainring kind-of-days, it's really nice to be able to enjoy the camaraderie of fellow riders. That lake looks so cold... Yes, meeting new people must be the best of the experience. I am so enjoying following your travels! You are a fun writer and I look forward to every post. Have fun, be safe, and keep those posts coming! I agree! I love hearing about your days! Keep writing!